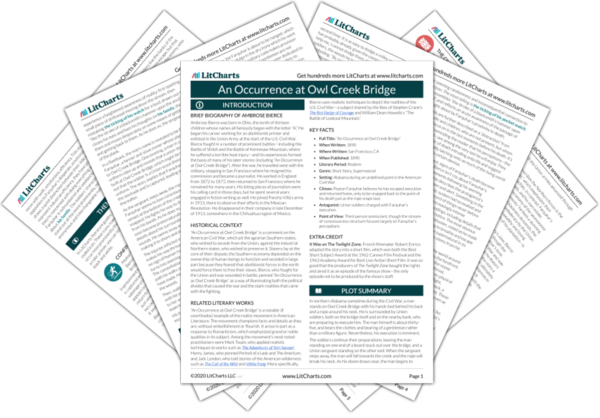 Instant downloads of all 942 LitChart PDFs (including An Occurrence at Owl Creek Bridge). 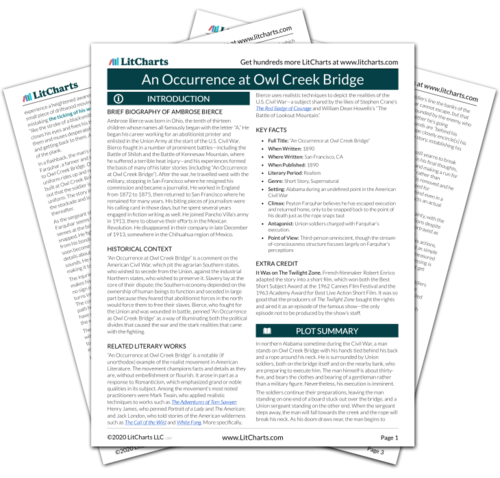 Welcome to the LitCharts study guide on Ambrose Bierce's An Occurrence at Owl Creek Bridge. Created by the original team behind SparkNotes, LitCharts are the world's best literature guides. A concise biography of Ambrose Bierce plus historical and literary context for An Occurrence at Owl Creek Bridge. A quick-reference summary: An Occurrence at Owl Creek Bridge on a single page. In-depth summary and analysis of every of An Occurrence at Owl Creek Bridge. Visual theme-tracking, too. Explanations, analysis, and visualizations of An Occurrence at Owl Creek Bridge's themes. An Occurrence at Owl Creek Bridge's important quotes, sortable by theme, character, or . Description, analysis, and timelines for An Occurrence at Owl Creek Bridge's characters. Explanations of An Occurrence at Owl Creek Bridge's symbols, and tracking of where they appear. An interactive data visualization of An Occurrence at Owl Creek Bridge's plot and themes. Ambrose Bierce was born in Ohio, the tenth of thirteen children whose names all famously began with the letter “A.” He began his career working for an abolitionist printer and enlisted in the Union Army at the start of the U.S. Civil War. Bierce fought in a number of prominent battles—including the Battle of Shiloh and the Battle of Kennesaw Mountain, where he suffered a terrible heat injury—and his experiences formed the basis of many of his later stories (including “An Occurrence at Owl Creek Bridge”). After the war, he travelled west with the military, stopping in San Francisco where he resigned his commission and became a journalist. He worked in England from 1872 to 1875, then returned to San Francisco where he remained for many years. His biting pieces of journalism were his calling card in those days, but he spent several years engaged in fiction writing as well. He joined Pancho Villa’s army in 1913, there to observe their efforts in the Mexican Revolution. He disappeared in their company in late December of 1913, somewhere in the Chihuahua region of Mexico. 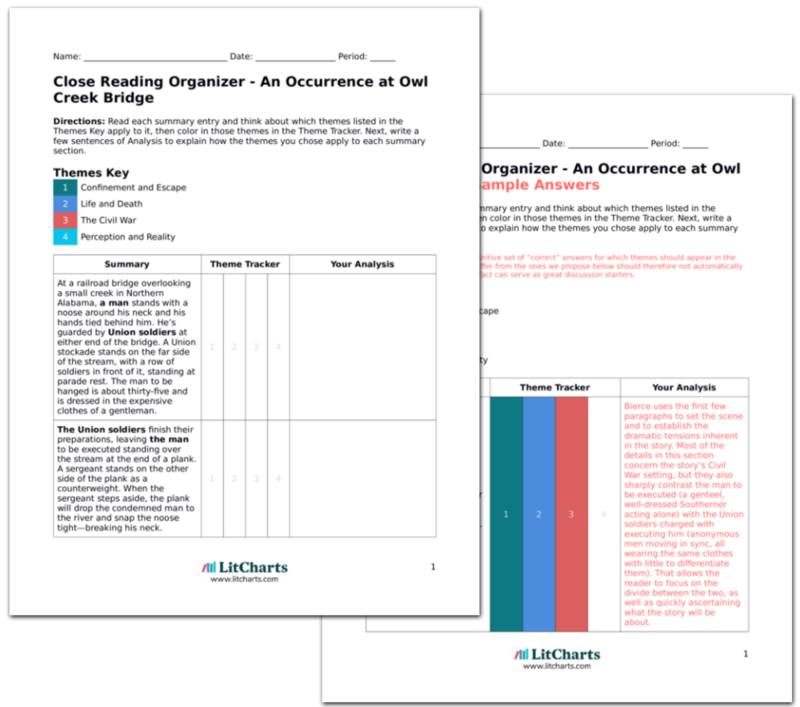 Get the entire An Occurrence at Owl Creek Bridge LitChart as a printable PDF. “An Occurrence at Owl Creek Bridge” is a comment on the American Civil War, which pit the agrarian Southern states, who wished to secede from the Union, against the industrial Northern states, who wished to preserve it. Slavery lay at the core of their dispute; the Southern economy depended on the ownership of human beings to function and seceded in large part because they feared that abolitionist forces in the north would force them to free their slaves. Bierce, who fought for the Union and was wounded in battle, penned “An Occurrence as Owl Creek Bridge” as a way of illuminating both the political divides that caused the war and the stark realities that came with the fighting. Antagonist: Union soldiers charged with Farquhar’s execution. It Was on The Twilight Zone. French filmmaker Robert Enrico adapted the story into a short film, which won both the Best Short Subject Award at the 1962 Cannes Film Festival and the 1963 Academy Award for Best Live Action Short Film. It was so good that the producers of The Twilight Zone bought the rights and aired it as an episode of the famous show—the only episode not to be produced by the show’s staff. Vaux, Robert. "An Occurrence at Owl Creek Bridge." LitCharts. LitCharts LLC, 30 Jan 2019. Web. 21 Apr 2019. Vaux, Robert. "An Occurrence at Owl Creek Bridge." LitCharts LLC, January 30, 2019. Retrieved April 21, 2019. https://www.litcharts.com/lit/an-occurrence-at-owl-creek-bridge.